"your system is very straight forward and in general easy to install"
​Just a quick note to let you know that the solar system I purchased from you this past summer is working well and to thank you for all your help along the way. I have attached some pictures of the system. I used Steve Boss of Boss Canvas, Clayton, NY for the canvas work. Steve did an outstanding job as can be seen in the attached pictures. As you had mentioned, your system is very straight forward and in general easy to install. The most difficult part for me was finding somebody able to do a good job on the canvas work. I hope the photos will be helpful to any of your other customers that may want to do something similar. Again thanks for a great product and service. "​Your advice in the past was great and we value your opinion - system is working GREAT." 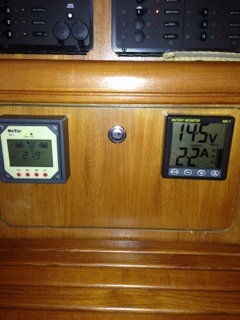 We bought solar panels and controller from you a few years back and the system is working GREAT. 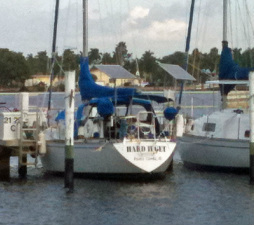 Now we are planning to add a Freezer to our boat for extended cruising down South. 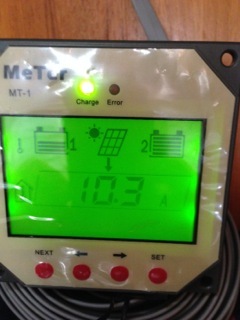 We currently have 2- 100 W solar panels which charge two banks of 2- 4D batteries (4 batteries total). By alternating the banks each day we have enough power to carry the load thru the night without any external power source. So the question is this… will adding the freezer be too much for the panels to carry? IF an additional panel(s) are needed how many and how many watts? Lastly how should we look to add the panels to the current system, controller or should it run thru a separate controller. I appreciate your thoughts and recommendations. Your advice in the past was great and we value your opinion. Great to hear from you and glad to hear your system is working well. 1. I'd install the freezer and see how if the solar system keeps up. You have plenty of battery power which is good. If the system can't keep up there are some options. 2. 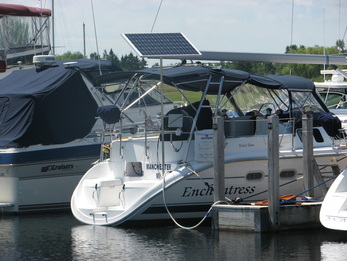 The best way to add marine solar is to use flexible panels on your bimini. 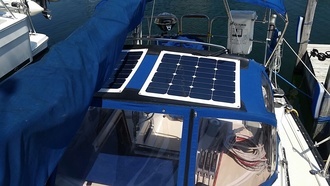 From your picture, it looks like you could add a single 110 watt panel or perhaps two of our 70 watt panels parallel with the line of the boat. It will have a 130 watt and a 160 watt flexible panel available in mid August. The 130 is the same size as our 120 listed on the website. The 160 will be about 26 x 54. 3. Because these are monocrystalline cell panels and have different performance characteristic than your current panels, a separate controller would be best. Although, you have capacity for an additional 7 amps on your current controller so you could tie in a 110 or two 70 watt panels and see how it works. 4. 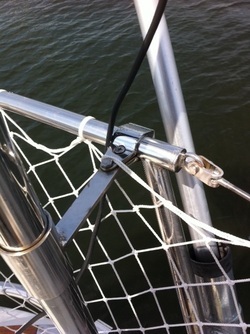 We are experimenting with super strong rare earth magnets as an option to attach flexible panels to biminis. We aren't sure about rust prevention but are doing some tests. 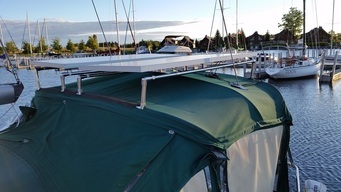 The advantage of this approach is that you don't have to put holes in your bimini for mounting. 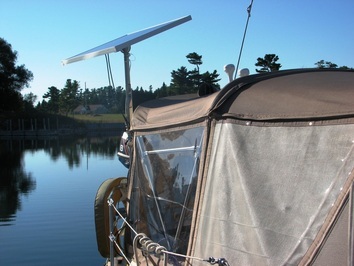 Another advantage is that the panels are easy to remove if you want to fold up your bimini. Just an option to think about. "Just loving our solar system and thinking of you." 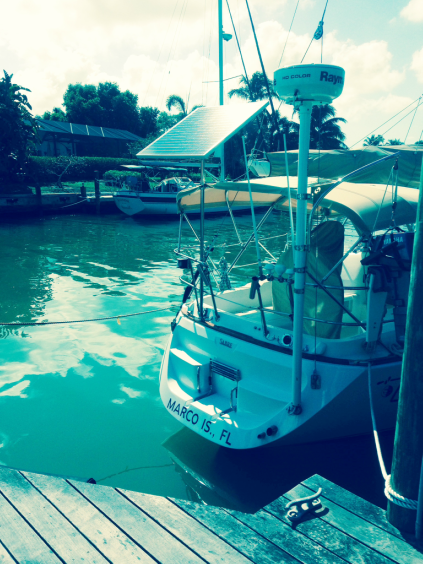 We are on a mooring in Vero Beach Florida watching our battery monitor tell us we are at 13.33 V at 5:30 in the afternoon! Just loving our solar and thinking of you. We went to shore for warm showers wishing I had your hot water system! ​Hope all is well with you and your family. "We are so pleased that we are adding two more panels in preparation for a cruise to Mexico." 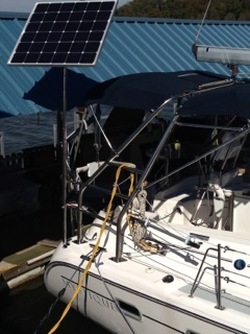 In April of 2017 First Mate Marine Inc.a dealer for for Custom Marine Products, supplied and installed two CMP 110 watt semi-flexible mono Sunpower Cells along with controller, display and temp sensor. The installation was first class and we couldn't be happier with the performance. 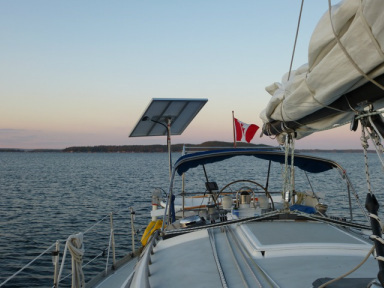 We took a two month summer cruise circumnavigating Vancouver Island and tested the system On the hook we average 110 amps a day consumption. With 4 105 amp AGC batteries that meant we used to run our genset every other day for 2-3 hours. With the addition of the solar panels we found that we were adding 55-65 amps a day to our batteries and could go 4 days without using the genset at all. We are so pleased that we are adding two more panels in preparation for a cruise to Mexico. 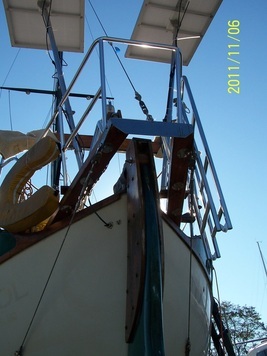 Hurricane Direct Hit - "After cleaning it of mud and salt water I gave it a try. It works!" Our house and boat were in the direct line of hurricane Irma. We had sustained wind of 115 mph for 45 minutes and experienced gusts above 130mph. In preparation for the storm I moved our pole mounted panel below but left the davit "permanent" mounted panel were it was installed. The panel and all of the mounting hardware ripped away and flew down the Canal. Five days later I found it. After cleaning it of mud and salt water I gave it a try. It works! 19.90v Can't believe it but it's ready to be put back into service. Here are pictures slowing the extra hardware I used for additional support and in one picture you can see the damage to the frame. "We are thrilled with the whole experience from design, installation, and customer service." 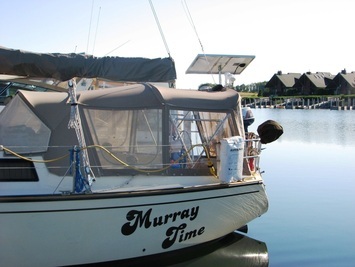 On our first cruise to the North Channel of Northern Lake Huron we had to run our engine in the morning and again in the afternoon to keep the batteries up. 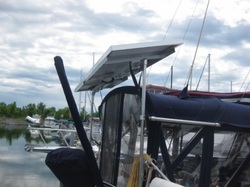 When we arrived at St. Ignace we saw many boats with a solar panel on a pole and the sailors told me Tom Trimmer from Custom Marine Products was the designer. 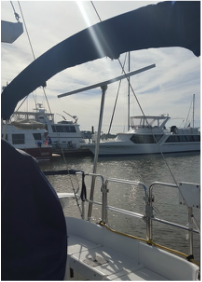 Tom came to our boat and we discussed our options and decided on his semi flexible panels, MPPT controllers and monitors and to do a Bimini mount. 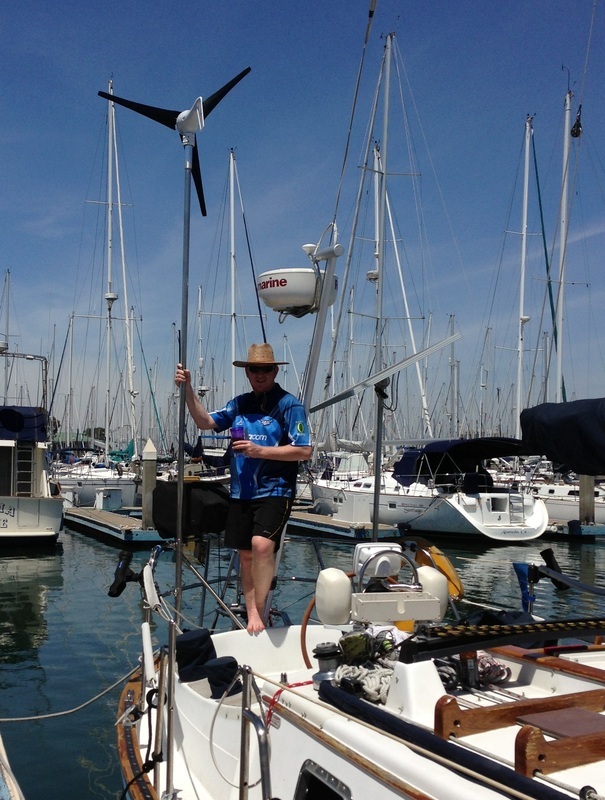 Tom helped us with numerous installation questions and even arranged to meet us in the North Channel to trouble shoot an installation error. His customer service is really unbelievable; he even contacted us weeks later to check on how the panels were working. And working they are! 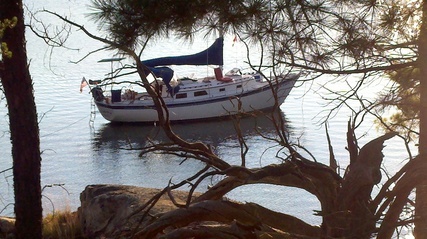 At anchor for days we never had to start the engine to charge our batteries which run our house bank that includes our refrigerator and freezer. We are thrilled with the whole experience from design, installation, and customer service. 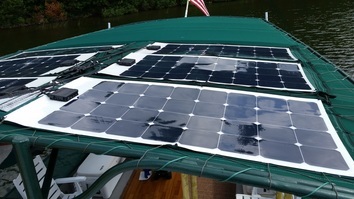 As we continue our cruise south we tell all interested in solar to contact Tom at Custom Marine Products. 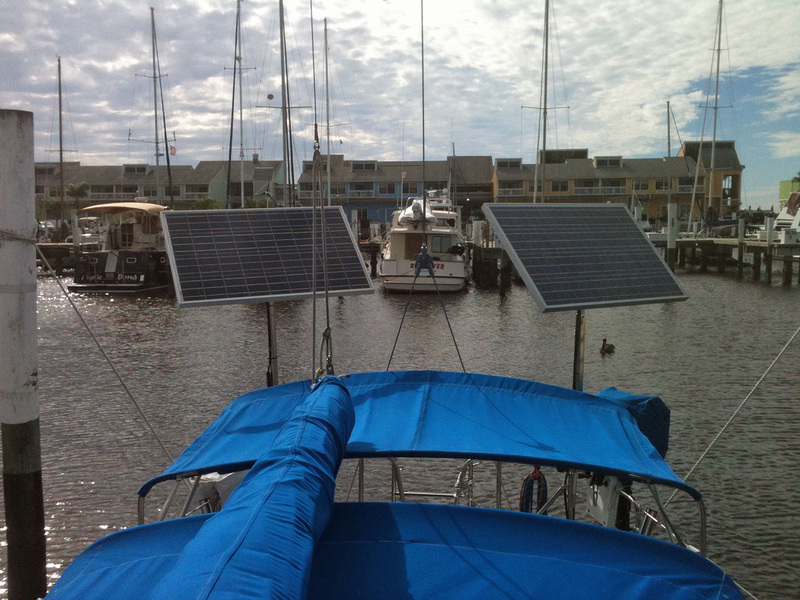 "Adding the solar panels in addition our Efoy was a real game changer." We visited with Bob Dickey of First Mate Marine (Custom Marine Products northwest distributor) at the 2017 Seattle Boat Show and followed up with a get together on Skye Castle, our 42’ Tayana Pilot House trawler. We took the plunge and ordered four 160 watt Bosch solar panels with two Tracer BN series MPPT controllers. Bob walked me through the installation and I did the install myself. With the exception of running the wires through some tight spaces the installation was very easy. Pretty much plug and play. ​"As we watch the amps flow into our batteries, we are extremely satisfied and very grateful for the extraordinary customer service that Tom gave us." ​It’s hard to find good customer service; exceptional customer service is even rarer. 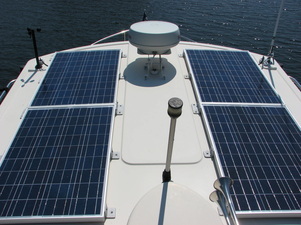 We found Custom Marine Products from a simple online search for solar panel controllers. We liked that the company is in Michigan, our home state. 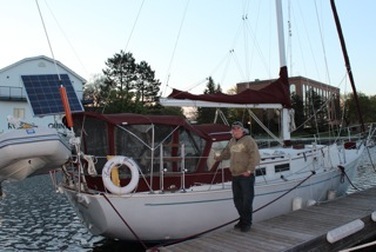 When calling for more information, the owner, Tom Trimmer, answered the phone while on his summer cruise in the North Channel area of northern Lake Huron, Ontario. Tom listened to our needs and recommended a dual output controller and monitor. 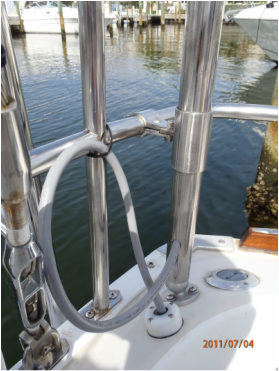 Custom Marine Products was extremely easy to work with. Tom arranged for quick shipping so that we could get the controller installed before we took off for our long awaited cruise to the North Channel. Our electrician installed the controller to interface with our other charging systems. 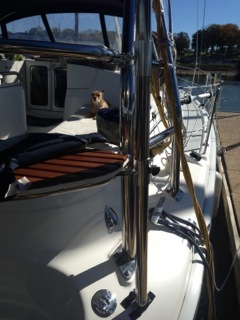 While we were underway, we discovered that we weren’t getting any amp readings on the monitor. 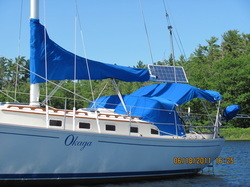 A call into Tom resulted in arrangements to meet up at his home port in Cheboygan, MI. He offered us a complimentary slip right next to his. Tom tested the installation and discovered an error in our wiring. Unfortunately, one channel of the controller got zapped in the testing. Tom was quick to arrange for a new controller to be sent to us at DeTour Harbor, our next stop. While in Cheboygan, Tom took the time to give us tips on anchorages not to miss in the North Channel. Turns out, that Tom is a legend in the North Channel. 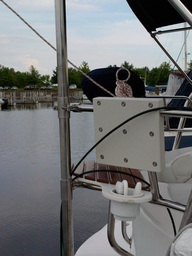 We have met several cruisers using Custom Marine Products. We even met a couple living off the grid who used solar and Custom Marine Products at their beautiful home in Hotham Bay. As we watch the amps flow into our batteries, we are extremely satisfied and very grateful for the extraordinary customer service that Tom gave us. So, what started out as a customer service issue has turned into a cruiser’s dream. Thanks for recommending sheplers, they took great care of us. Very competent and fair price. Feeling much better about charging system. On our way to deTour, looking forward to installing new controller. Do you want me to send old controller back to you ? ​"Thought I’d drop a line regarding the exceptional customer service provided by one of your advertisers - Custom Marine Products and the owner Tom Trimmer." I got on Tom[‘s website (custommarineproducts.com) and was amazed at the wealth of background and technical information available. He even has spreadsheets that will allow you to easily calculate the electrical loads for both stationary and underway situations, including various losses and reductions. Using this new found knowledge (a little being a dangerous thing) I ordered two 120 watt panels & a 20 amp MPPT controller with monitor. A couple of days later I got an email back from Tom as a follow up to discuss specifics on my planned setup. 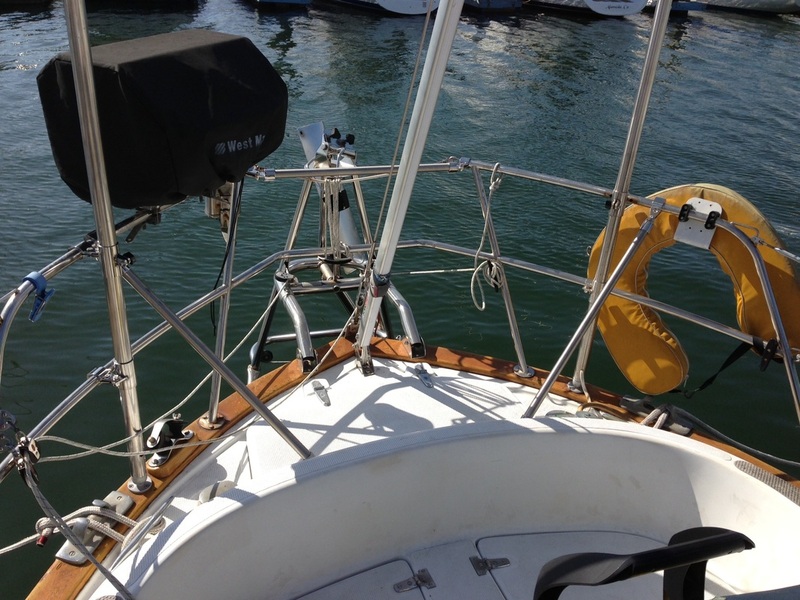 He suggested using two 10 amp controllers with separate monitors to achieve better output with the side mounts and mizzen shadow. In addition, he noted several fittings I had overlooked in the original order. He re-worked the invoice to provide the additional material with minimal additional increase in cost to me. "I wanted the highest output per square foot so I went with monocrystalline panels using SunPower cells." Three 120 watt solar panels with SunPower Cells. ​ I recently completed an upgrade of my previous single panel system on SoLunaMare (Saga 43 # 27) and thought I'd share just a few points without getting into a deep technical discussion. One of the factors that required considerable research for me was determining the maximum panel size I could install without undertaking a major structural redo and with minimal shading issues. 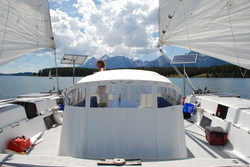 As you can see in the attached photo (before my bimini was reinstalled) positioning three 120W panels across the aft end of the cockpit worked well. For that area, fairly free of shade, I wanted the highest output per square foot so I went with monocrystalline panels using SunPower cells. These are very high quality cells that have the highest efficiency rating I could find. 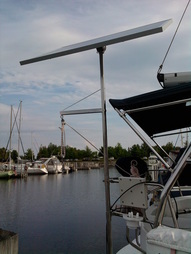 I purchased the panels from Tom Trimmer at www.custommarineproducts.com. We had numerous shipping hassles with Fed Ex damage but I have to give Tom a 5 star rating for both his customer support and his knowledge of system design. Feel free to use my name as a reference if you communicate with him. The offerings were not the cheapest per watt available (nor the most costly), but in the long run, like other gear, an extra 20 or 30% up front for quality components would seem to make sense. In preparation for long distance cruising I wanted maximum redundancy, so decided to go with a separate MPPT controller for each panel. That way, any single failure will only degrade my overall performance by 33%. I had used the Genasun 10.5A controller previously with good results, so bought two more of those and you can see the wiring layout in another of the attached photos. Each controller costs only around $100 online. ​I was originally going to install an output display for each panel but space limitations and the additional wiring convinced me to simply wire inline on/off switches for each panel as shown. When desired I can easily check each panel individually by flipping just one to the On position and using our Link system to evaluate output. 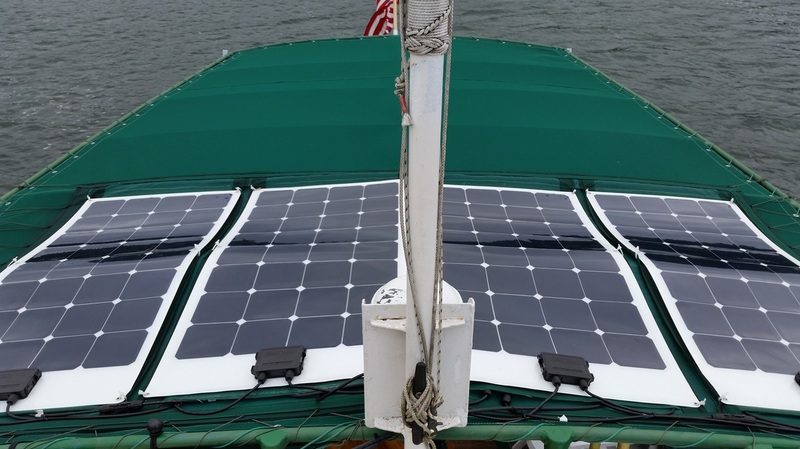 Overall, I'm very happy with the investment which came in at less than $1500 total, and would encourage anyone planning an extended cruise to make solar a primary contributor to your power needs.
" 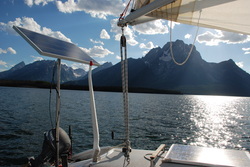 the panel & mount withstood the 50-60 mph winds with gusts to 70 mph with no problems!" 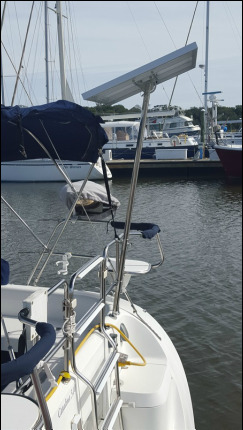 Wanted to let you know that my solar panel mount on the pole off the stern survived TS Hermine which caused considerable damage in South Georgia. 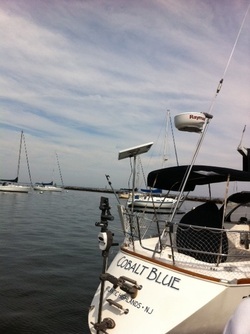 There were 3-4 boats sunk and numerous docks destroyed in our marina and the marina next door in St. Simons. We had no damage thankfully and the panel & mount withstood the 50-60 mph winds with gusts to 70 mph with no problems! "The package is perfect for our needs." 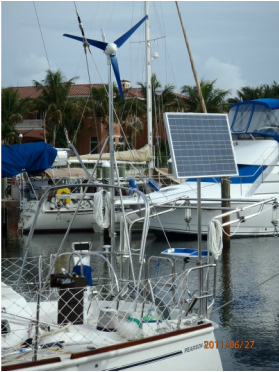 We have two of your 130 watt monocrystalline solar panels which were installed on the bimini of our 40 foot sailboat in the Spring of 2014. They produce, or should produce, enough to power to accommodate our energy needs at anchor for an extended period of time, assuming the normal sunshine in the Northern Great Lakes. And they have done a great job of it. The panels were producing a minimum of 5 amps early in the morning and an hour before dusk and upwards of 12 amps mid-day. But something was missing--it was the regulator. We had an old PWM regulator that just wasn't allowing the panels to give to the batteries what they were capable of giving. After consulting with you, and running a few tests to make sure the problem wasn't the panels or the wiring, you recommended installing a new MPPT Tracer regulator. It wasn't cheap (very little that is good is), but it made all the difference. We haven't done any calculations, but your estimate of a 30% increase in the efficiency of the panels is spot on. Could be even higher. The package is perfect for our needs--it allows us to avoid going into port except once every ten days or so and that is mainly for provisioning. Also, just to let you know, the fridge is running and the panels/regulator is creating a positive charge to the batteries of about 8 amps.....and the sun is not yet at its peak. 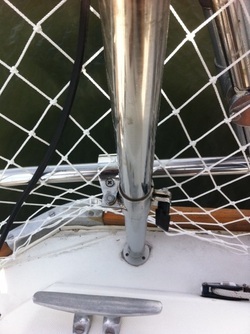 We now have plenty of power at anchor and don't need to plug into shore power while at the dock. Thanks for working with us to enhance our cruising experience. "The early results have been stellar." ​Several months ago I posted a question about solar vs a generator and got plenty of opinions which is what I asked for. 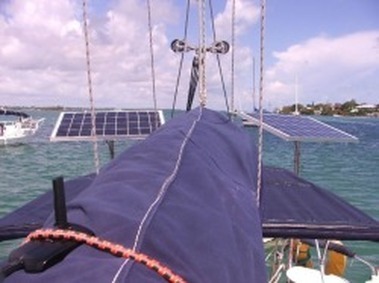 Decided to go the solar route but have some self-inflicted constraints such as: (1) no davits and no plans to add them and (2) have a bimini but only open it when it is raining. This makes it difficult to dedicate the space for a large bank of panels to keep my 290AH bank of batteries full on my relatively small 31 foot boat. After much research i decided to go for maximum efficiency and install a "pointable" panel to get max amperage with the minimum size panel. 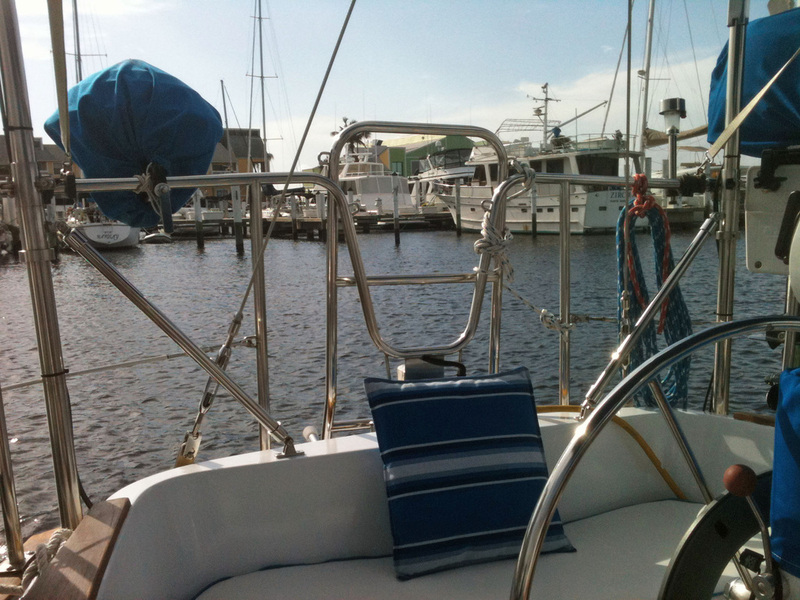 The pole mount off the stern was very easy to install and it clears the bimini (which was not an accident, it took several mock-ups with cardboard to determine the minimum pole length). Also installed an MPPT controller and battery monitor. The early results have been stellar. The main power draw is refrigeration and I first double insulated the icebox, replaced the Adler Barbour compressor & evaporator with a brand new more efficient unit. Now the batteries are down about 7-8% overnight and are back to 100% by early-mid afternoon if I do not rotate the panel and before noon if I do. When rotating the panel I can double the output. 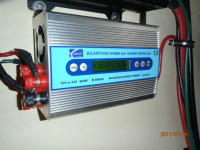 See the attached pictures of the amperage. These were taken within 2 minutes of each other at 9 am this morning with the only difference being I rotated and tilted the panel to face the sun. Input from the panel and output to the batteries more than doubled. 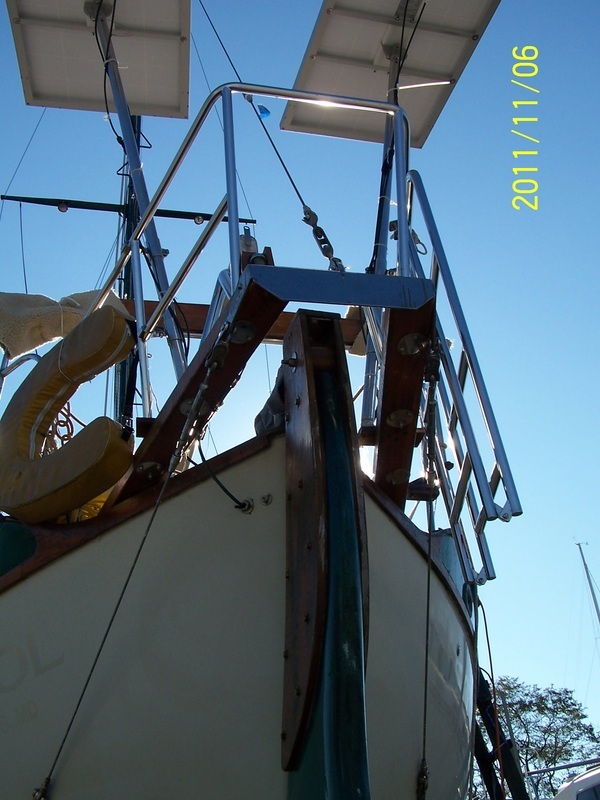 I am writing this just to give information to others because the amount of information on single, pointable, pole mounted panels is very limited compared to the banks of panels mounted to biminis, davits and even dodgers. The panel I purchased is a Bosch 120 watt and it is supposed to be very efficient (most efficient on the market they said) according to the company I bought it from (Custom Marine Products). They said to expect 5.5 amps from the panel and the MPPT controller would then deliver 7.5 amps to the batteries. See the pictures here it has already exceeded that. If anyone wants to know where purchased or anything else let me know and I will be glad to help. So far, this looks like a great solution for my specific needs but of course is not for everyone. Follow up question 4/27/16: I was just looking at your updated website and wondered if the new 120 watt SunPower panel is the one that I purchased? Worked very well last week on a one week trip away from the dock. Saw 8 amps coming from the panel and 11.2 amps from the MPPT controller to the batteries! New record. Yes it is the same panel as you purchased. It is powered by premium SunPower solar cells and is our best performer when matched up with an MPPT controller like you have. 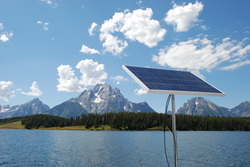 Maximum Output from 120 Watt CMP Solar Panel with Pole Mount. 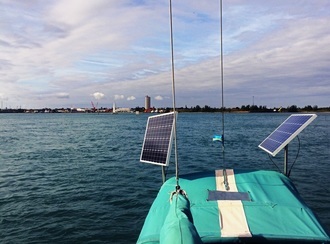 ​"Our 100 Watt Flexible Panels Have Worked So Well We are Adding Two More." 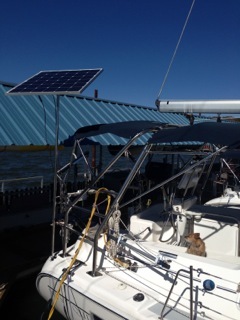 We attached our 100 Watt panels to a heavy screen material and then attached that to our bimini frame. We can remove the panels easily for winter storage. These panels, combined with our Midnite Kid controller provide us all the power we need for cruising. We no longer have to run our generator 2-4 hours a day. We love it! We will be adding two more panels this year so we have plenty of power to heat our water with the excess solar capacity. 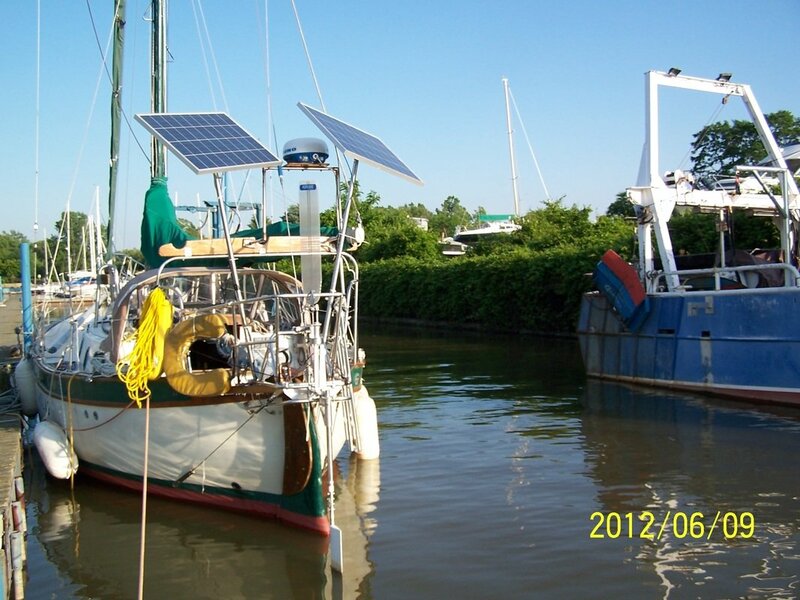 The Tug Albin & Co.
See the attached picture for our new configuration of six 100 watt solar panels. We now have three groups of two series wired panels wired in parallel as you suggested. The performance is terrific. ​Below you will find the pre-solar and solar generator hours. 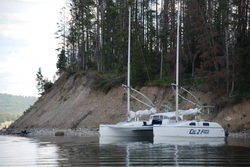 Our neighbors in the North Channel anchorages were much more friendly in 2015 and 2016, even inviting us to happy hours and for dinner‼️ And we now have several unused generator filters on hand which will probably have to be offered to our non-solarized boating friends who haven't yet made the "sun power" leap. Thanks for all your support and assistance. "These flexible panels are smokin! :-)"
Once I turned off my shore power charger and used the panels to keep my battery charge up they really pumped out the power. I was reading upwards of 7 amps on the meter. They are smokin! 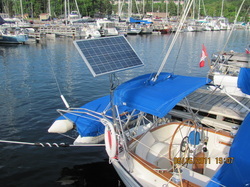 I ended up using stainless steel nuts/bolts/washers to attach my two 50 watt solar panels to my dodger. I also had my canvas guy punch out two inch round black leather discs I glued to the underside for added lateral strength. Next I placed a two inch nylon shoulder washer over it to further adhere the leather to the canvas and to gain vertical holding power. I sandwiched the canvas between the washers and secured them with a nut. The 10-32 bolts fit perfectly through the panel gourmets. As you can see, this made a very clean (and water tight) installation. Running the wires in the canvas channel along the support tubing worked great. One question: my amp readout numbers yesterday were real low, around .5 and with a max of only 2.5 on a very sunny day. I will check again later today. The batteries were already in a fully charged state. Is the readout measuring what is being sent to the batteries which would be minimum since no addition power is required? You are correct. The meter shows what the controller is putting in the batteries. When the batteries are fully charged, the controller shuts down the charge from the panels to protect the batteries from overcharging. Turn off your shore charger and see what happens.